Business etiquette is concerned with socially acceptable ways of behaving in a professional environment, and is so intrinsically linked to our culture that it’s probably something that you think very little about. When was the last time you considered correct etiquette for dining with a colleague, or debated the correct greeting to a client? In all likelihood, you don’t even ask yourself these questions because you are so well practised with carrying them out on a day to day basis that they have become second nature. Yet, add in the international perspective, and suddenly the horizon becomes littered with obstacles and hazards. What is acceptable in a business capacity for one country will almost certainly will differ in another. Business etiquette in three Asian countries for the global professional. Japan: Japan is a good example of a very different culture, and one that can be difficult for the unprepared business visitor to negotiate successfully. Firstly, it is a collective nation where the prevailing culture supports the needs of the group over the individual, and this fact alone can make a Japanese workplace feel quite different to that of say an American organisation. From a communication perspective, much of communication is symbolic and implicit and you have to work hard to decode what is actually being said. The Japanese term Nemawashi is a good lens for understanding the culture, roughly translated it means ‘laying the groundwork’ and this is what is required in business interactions. Don’t spring unexpected business plans on colleagues or associates, be prepared to put the work into developing the relationship before making requests or presenting information and always adhere to hierarchical etiquette. In Japan, the most senior executive would be seated at the head of the table, with seating following this pattern of rank and importance, and the highest ranking person being served refreshments first. 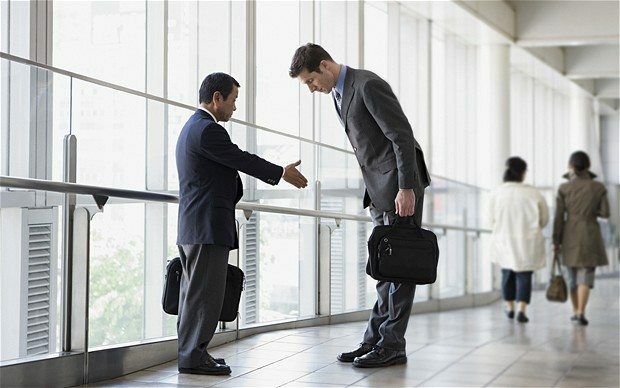 A bow would be customary when meeting a Japanese business associate (perhaps also accompanied by a handshake) and business cards should be given and received with due respect. Brunei: In countries such as Brunei, Malaysia and Indonesia, personal relationships are integral to professional interactions. Those in ASEAN cultures want to know the person behind a business, even their family, and it would be quite normal to be invited to dine at a client or business associate’s home as a precursor to business being conducted. To decline, based upon British reserve or assumptions that they are merely offering an empty invite that they never expect you to take up, would likely sour the relationship irrevocably. The formal dining experience is also likely to be rather different to the UK, with little adherence to defined courses with specific cutlery and glassware for particular courses as we might expect. It’s often a rambunctious affair and less defined by British dining etiquette. And a note on admiring your associate’s personal possessions, do this with caution as they are likely to feel obligated to give them to you! India: In India, time is usually more fluid, and a business meeting scheduled for a specific time is more of an indication than a set rule. This can also apply to structure within meetings, which can be more protracted. Similar to ASEAN cultures, when working in India, you may well be invited into the home of a colleague or associate as this would be considered culturally hospitable. Remove your shoes when you enter their home, placing the soles of your shoes together and ensuring you don’t show the soles of your feet when doing so or during the meal as this is considered impolite. Most Indians would eat without utensils, but these may be on hand if guests are present. If not using utensils, eat with the right hand or both if one is insufficient, but never the left alone. A gift would be acceptable (although not expected), but avoid alcohol or leather products. There are numerous business etiquette considerations when working internationally, not only in terms of the correct procedures and rituals that you will be expected to adhere to, but even to your personal presentation and verbal discourse. In many cultures wealth is viewed quite differently from the rest of the world. In Europe you can’t speak of being wealthy as it would negatively impact your image, it’s about being self-effacing and toning down what you may have. Discussions of money, pay or self-aggrandising behaviour would be entirely inappropriate. Whereas in Russia, the US, China and other countries such as the Ukraine, wealthy individuals embrace their wealth, even exaggerate it, and this can enhance their image. Similarly, you should consider adapting your personal presentation to the culture. In Asia and America, the purchase of luxury goods is a demonstrable example of your success, something to be celebrated and admired in contrast to Europe and its more understated, classical ideas of wealth. This might impact upon the way you dress or the accessories that you select for business meetings. We have taken a brief overview of just some of the many, many ways in which business etiquette varies across international borders. From the prosaic to the extremely complex rituals that sit within the fabric of the culture. That you have taken the time to understand and appreciate the culture of the country you are visiting will always be appreciated, whether you have learnt a few words of greeting in the native tongue, adhere to the rituals that your associates will expect or are able to set others at ease with your level of comfort in the surroundings, each small effort you make will enable you to develop stronger relationships and ultimately achieve your professional aims. Paul Russell is co-founder and director of Luxury Academy London, www.luxuryacademy.co.uk, a multi-national private training company with offices in London, Mumbai and Visakhapatnam. Luxury Academy London specialise in leadership, communication and business etiquette training for companies and private clients across a wide range of sectors. Prior to founding Luxury Academy London, Paul worked in senior leadership roles across Europe, United States, Middle East and Asia. A dynamic trainer and seminar leader, Paul has designed and taught courses, workshops and seminars worldwide on a wide variety of soft skills.